Welcome to Monday – Are you ready for a great week? If you want to see how not to handle rumors about the health of a candidate, then check out how the Clinton campaign handled Hillary Clinton getting sick at the 9/11 Memorial on Sunday. The Associated Press reported that a video showed Clinton staggering and eventually slumping forward before being held up by three people as she was helped into a van. Then the AP reported the damage was compounded by the nearly eight hours of silence from Clinton and her team about the health scare, as well as the Sunday evening disclosure she had been diagnosed on Friday with pneumonia. The Clinton campaign canceled a fundraising trip to the west coast because of the illness. Is it a problem? Yes. Presidential candidates have a tough schedule, so it’s not a surprise that a candidate would get sick on the campaign trail. But the Clinton campaign should have been more open about her illness – now her health is an issue. For months I have been waiting for a free Donald Trump bumper sticker. I sent an email to the Trump campaign many months ago asking for one. I also asked for a free bumper sticker from Hillary Clinton and received it months ago. 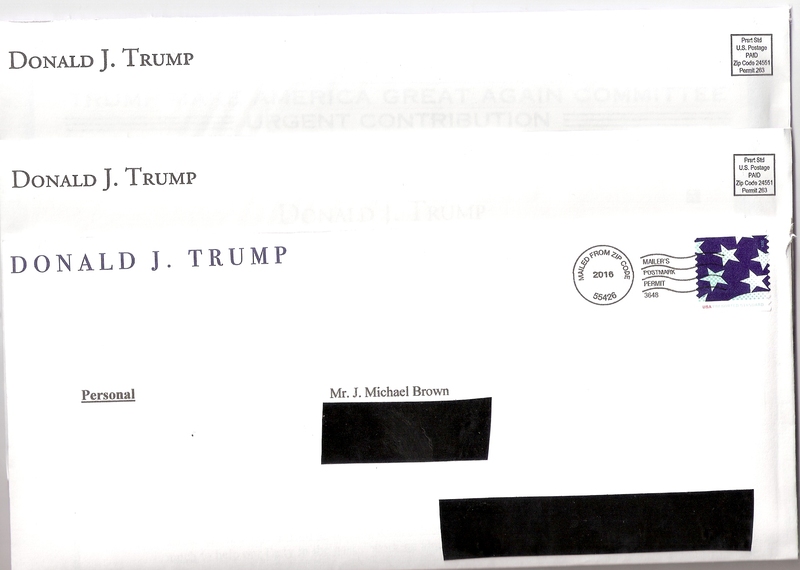 So I was surprised (and excited) when I went to my mailbox on Friday and I had a “personal” letter from Donald J. Trump. I quickly opened it to find no bumper sticker, but there was a four-page request for money. On Saturday, I once again went to the mailbox and I had TWO more letters from Donald J. Trump – no bumper stickers, but with a four-page request for money. It’s pretty bad when you can’t get one free bumper sticker. It’s even worse when the Trump campaign wastes money on postage to send you three identical mailings. Next time you travel, it might be good to see if Tom Hanks is on the plane, train, bus, etc…. This entry was posted in Campaign 2016, Donald Trump, Hillary Clinton, Politics and tagged Donald Trump, Hillary Clinton, Hillary Clinton's health, pneumonia, Tom Hanks by Jackie M. (Mike) Brown. Bookmark the permalink. Listening to your whimsical rants about free bumper stickers for months is hilarious! One lesson that I have learned from you is that Democrats will send you what you want for free, the GOP wants you to get out and earn it or at least contribute to get one! Makes sense now…you see the GOP knows you won’t put it on your car/truck and the Democrats don’t care what you do with it.They just made sure they bought some mindshare for the cost of a cheap bumper sticker! But it does fit in with their party lines, Democrats are the party of free, free healthcare, free birth control, free college, more welfare, more entitlements and the GOP is more like…well, you get the picture. But Tom Hanks made it back home every time with a crazy story to tell! Barry – Thanks. I have received free bumpers stickers from a few on the right, too. I had someone send me an email this morning and they said they would send me a Trump bumper sticker. You can also look at it as the folks who have sent me a free bumper sticker: Sanders, Clinton, Juneau, Bullock, Gianforte, Juras, like to get a little free publicity for the price of a stamp. It never hurts.